Born in Germany and now a proud Nebraskan, Alexa Allen is a military brat, socialite, “Downton Abbey” enthusiast and fierce friend. Although Allen is only 21 years old, she has already lived an adventurous life, living in three different countries across the world. 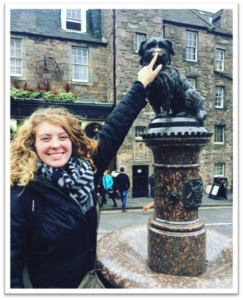 Allen now resides as a communications major at Wesleyan University in Lincoln, Nebraska. Upon our meeting and within the first few days of living in England, Allen revealed her infectious and envious socialite abilities, something she attributes to moving around the country as a military brat. Emily Wotzka (EW): You’ve had quite an interesting life so far. Tell me about being born in Germany and your childhood as a military brat. Alexa Allen (AA): Right, military life. Well, you have just asked me about my favorite topic ever, so good for you. So within the military, there are the Army, the Navy, the Marines and the Air Force branches, and my dad was in the Army. So growing up I lived in five different places. First, it was Germany, then Wisconsin, Colorado, Georgia, Kansas and then I moved to Nebraska to go to school. For the military, that’s actually not a lot of moving around. Usually, people move around a lot more. That was mainly because my dad had a lot of deployments, and, although this was sad, it was good because we didn’t have to move as much. EW: How did it feel having to move around every few years? AA: It was definitely rough. Every year we had new neighbors. Everyone was new at school. Practically every year, everyone would rotate. In a way, it was really great because it forced me to become really social and helped me to make a lot of friends really fast. But now looking at it, I’m definitely not good at keeping long-term relationships because I’m so used to having a friend, thinking they’re going to be around for two years and then I’m going to move and probably never talk to them again. And that’s just how I grew up. 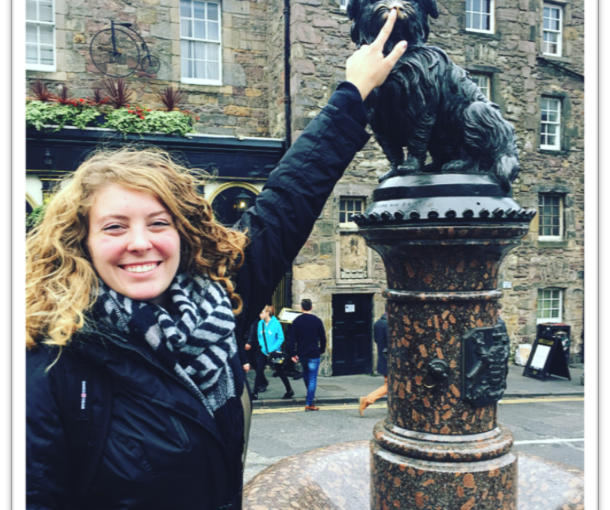 Alexa Allen continues her adventurous life at her young age by studying abroad in Europe. EW: Did the constant moving around inspire you to move abroad during college? AA: It’s definitely made me not afraid to go to new places. When I came to college it was not a big deal, but it was just another move. I chose to study abroad because I had always done moves with my family, and I just needed to just do something on my own and just be my own person in a way. I did it more to find my independence. Coming to college, I was never homesick, never depressed or sad; you know, the stages that people normally go through. I never had that. Looking at it now, I really needed study abroad to be homesick and be sad, because I think everyone needs that. EW: Did you experience culture shock both going to England and coming back to America? AA: Going there, yes. For the first three weeks, I was really fine. I definitely had that honeymoon phase, and I was just wowed by everything. And then after that, the culture shock set in and it took me a long time to get out of it. It was very tough at times. I think it had a lot to do with my personality. I realized that I’m a homebody, and I just like to have my own space. That’s what makes me feel content. I just felt like I didn’t have a home; I was in this tiny little room. Coming back, I didn’t feel any reverse culture shock at all. EW: Did you have any out of body experiences during your time abroad? AA: Yes. When my mom came to visit we got to go to Highclere Castle where they filmed “Downton Abbey,” and that was honestly the best day of my life. Every time I talk about it, I just want to cry. I cannot express to you how incredible it was to be there and get a full tour of the castle. No matter how hard this trip (study abroad) was, this day made the entire study abroad experience worth it.